Daniel Bernstrom, a visually impaired writer, loves stories that have rhythm and music; stories, as Uri Shulevitz once said, "are the soundtrack to the child's silent film." 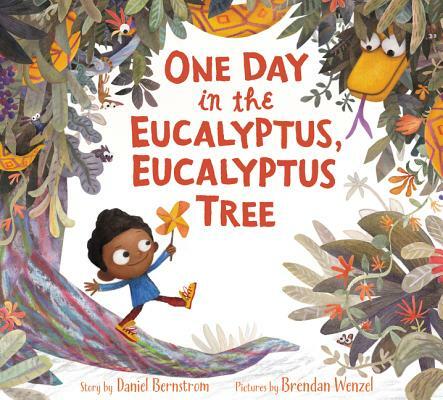 This story of the eucalyptus tree came to Daniel late one night while working as a janitor at a preschool. The eucalyptus tree (a favorite of his mother's), which grows along the coast of Northern California, tickled his tongue and imagination. The animals in the tree populated the preschool where Daniel worked, waiting patiently atop the shelf at the back for the next day of play. The strange combination of a tickly word and an odd assortment of stuffed animals spawned this undulating syncopated story of impossibility, darkness, and hope. Brendan Wenzel is an illustrator with a great affection for trees and all the furry, feathered, and scaly things that you can find in them (including snakes!). He has traveled to jungles, savannas, and everything in between in search of fascinating animals and has teamed up with many groups working to preserve wild places and creatures around the world. Brendan is the illustrator of Angela DiTerlizzi's Some Bugs. Brendan lives in New York with his wife, Magdalena. “Bernstrom’s spritely language rhythmically sings an exciting, laugh-filled, cumulative story. Bold, large print highlights the events as the snake slides, wiggles, and twists while the animals crinkle, munch, and buzz. Wenzel’s wildly imaginative, brightly hued digital illustrations are a wonderfully goofy complement to the action . . .